Suppose, just suppose that Vladimir Putin, Prime Minister of Russia (image far left), and Igor Sechin, the Deputy Prime Minister in charge of resource concessions (image far right), were stakeholders somehow of United Company Rusal, the state aluminium champion. 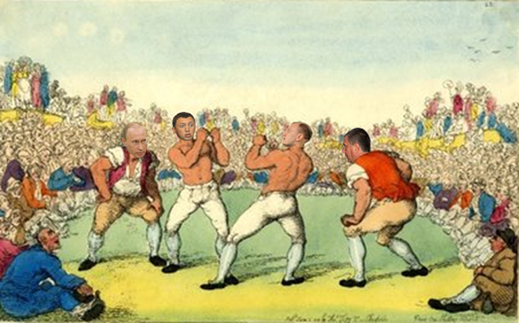 And suppose, just suppose they decided that the hostile takeover strategy of Rusal CEO, Oleg Deripaska (second left), against Norilsk Nickel, state nickel, copper and platinum champion, has gone too far, and is now depressing both companies’ share values. Accordingly, just suppose they have invited Deripaska, along with the controlling stakeholders of Norilsk Nickel, Vladimir Potanin (second right) and CEO Vladimir Strzhalkovsky, to come up with enough fresh cash to suit everyone, and enable Norilsk Nickel to buy back the 25% stake Deripaska purchased from Mikhail Prokhorov in better times, three years ago, for roughly $14.5 billion. And suppose, just suppose Deripaska has been in to chat with Putin and Sechin, and between them they have come up with a price Potanin and Strzhalkovsky say they can’t afford. That price Deripaska let it be known before Christmas is $16 billion — $4 billion more than Norilsk Nickel had lined up the financing to offer. How, do you suppose, can the extra 33% premium be paid for, our troika would have asked each other? Who’s got $4 billion, and who benefits if it is added to the Norilsk Nickel offer which Deripaska claims he will be satisfied with? The transcript ends at this point, and so does the record of the meeting which the prime ministry has been asked to clarify. With the fate of Russia’s two largest metals and mining companies hanging in the balance, not to mention that of the most heavily indebted man in Russia, and the problem of his $16 billion demand, is it conceivable that Putin stuck to discussing the fate of a downtown swimming pool above the Arctic Circle? Norilsk Nickel spokesman Victor Borodin acknowledges there was more to the meeting, but declines to give details. Izvestia, the Moscow newspaper, reports that “all other issues were discussed at the closed portion of the meeting. Apparently, the management of [Norilsk Nickel] managed to enlist the support of the Prime Minister on the further development of the company, despite the difficult corporate situation.” On the question of what was agreed between Putin and Strzhalkovsky, Norilsk Nickel referred to the prime minister’s spokesman. He refuses to say. In the past, Putin has met both publicly and privately with Deripaska and Potanin. Out of those meetings Potanin has emerged confident that Deripaska’s attempt at making his hostile takeover of Norilsk Nickel, and changing the board of directors, would fail, even before the shareholder votes had been cast and counted. The last defeat for Deripaska was on October 21. Eight weeks later, on December 23, a new round of voting was demanded by Deripaska, at the same time as he pressed Norilsk Nickel to raise its offer to buy him out. The registration deadline for Norilsk Nickel shareholders to register their eligibility to vote is February 4. The vote is scheduled for March 11. 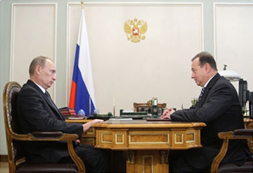 Putin’s meeting with Strzhalkovsky, the state’s appointee to run Norilsk Nickel since mid-2008, is the first time the two of them have directly and publicly met for a one-on-one discussion of the company’s business. It is a signal that for Putin and Sechin, the company’s future is in their hands, not in those of the oligarch stakeholders. In such circumstances, the move announced by Norilsk Nickel on December 20 to sell an 8% bloc of its treasury shares to the private, London-based oil and metals trader Trafigura is bound to have received advance approval from Putin and Sechin. Trafigura describes itself as “the world’s third largest independent oil trader and the second largest independent trader in the non-ferrous concentrates market, with access to approximately US$24 billion in credit facilities and investments in industrial assets around the world of more than US$1.5 billion.” In 2009, it reports turnover of $47.3 billion. In revenue terms, Norilsk Nickel appears to be one-third smaller, for Strzhalkovsky told Putin that last year its sales revenues came to $15 billion. Just how “strategic” Trafigura really believes the deal to be is revealed in the very short lock-up period agreed to for the shares. If Trafigura wants the right to sell out within six months, the detail makes the transaction appear to be a short-term expedient connected with Norilsk Nickel’s defence against Deripaska. Even less clear, at least publicly, is where Trafigura’s money will come from. Sources claim that notwithstanding the private trader’s hefty credit lines with international banks, the principal banks – Royal Bank of Scotland, BNP Paribas, Lloyds, and ING were the underwriters of a €400 million bond issue last March – refuse to finance the share purchase given the political and commercial uncertainties surrounding both Norilsk Nickel and Rusal. So Trafigura is buying the shares without western bank finance and without its own cash. That, sources say, requires the intervention of Russian state banks, the only ones Putin and Sechin will agree to take Norilsk Nickel shares as collateral for the loan. According to the same sources, Trafigura’s bank syndicate for the share deal is led by VTB, and includes Sberbank and possibly other state banks. That Putin is engaged directly in the Trafigura sale is also corroborated by sources in Moscow who point out that the share purchase by a foreign entity like Trafigura requires notification to, if not formal authorization by, the Control Commission for Foreign Investment, which is chaired by the prime minister. Time is very short – if Trafigura is to qualify to vote its Norilsk Nickel shares against Deripaska, then it must have Control Commission approval and closure of the deal by February 4. The Control Commission spokesman, Maria Chernova, refuses to discuss the case. For fast-tracking such a momentous decision, Strzhalkovsky had to go to Putin last Friday. It is likely the prime minister said more than “Good. We’ll see.” Suppose then that Strzhalkovsky asked Putin to say whether he agrees to Deripaska’s demand for the $16 billion payout; and suppose he also asked whether Putin agrees to approve the Trafigura scheme for adding between $3.5 billion and $4 billion to the $12 billion offer from Norilsk Nickel, which Rusal rejected on December 28. If so, the idea of Trafigura as the go-between provides camouflage for what is in most practical respects the state-directed and state-funded payment to Rusal, with subsidy effects for Norilsk Nickel, and share price gains for the stakeholders, including the state shareholders, of both companies. VTB has been identified in London as the syndicate manager for the Trafigura loan. Asked to say if it is participating, VTB took the position that it refuses to comment. At Sberbank, a detailed response was promised by the bank spokesman. Included in the questions was the request to say if Sberbank Capital, an important but little noticed investment holding of the main banking group, is involved. Sberbank Capital is more closely tied to the Federal Security Service (FSB) than it is to Sberbank’s chief executive, German Gref, according to a recent report by Vek magazine, published on December 28. That report, whose details cannot be immediately corroborated, suggests that Sberbank Capital was created two years ago for high-level debt collection and for warehousing problem assets covered by state bank liens and other forms of control applied by the government during the 2008-2009 crisis. By the start of last year, Sberbank Capital has been reported to hold $14 billion in asset value, and with its portfolio growing by about $5 billion a year. Its chief executive is Ashot Khachaturyants, a businessman turned administrator of the border control program of the FSB between 2004 and 2008. 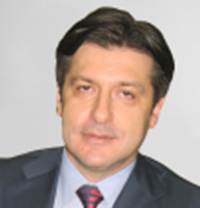 From there he became chief executive of Sberbank Capital. He also sits on the board of goldminer Polymetal, which is owned between Suleiman Kerimov and Mikhail Prokhorov. Last month’s Vek report, authored by Pyotr Trifonov, claims that through Khachaturyants’s connexions to the security services, Sberbank Capital has drawn closer to the Norilsk Nickel side of the conflict with Deripaska. Trifonov also claims that the result has been to neutralize the previous closeness between Gref and Deripaska, and their involvement together in Sberbank’s backing for Rusal’s Hong Kong Stock Exchange listing last January, and Deripaska’s attempt in 2008 to buy the Opel division from General Motors. The Vek report claims Sberbank Capital may be working against Deripaska, accumulating Rusal asset pledges, and possibly Deripaska’s personal Rusal shares. At the oligarch level in Moscow, those who are Deripaska’s peers believe that he has been quietly pledging blocs of his Rusal shareholding to secure the government’s rescue from default, long-term debt restructuring, and stock exchange listing favours on which Rusal’s survival over the past year has depended. A major international bank identified in the Rusal prospectus as one of the creditors signing the vital International Override Agreement of December 2009, which protects Rusal from bankruptcy, suspects that Deripaska has ceded 20%, possibly more, of his Rusal shareholding in trust to others. Officially, according to Rusal, Deripaska is the largest shareholder with a stake of about 48%. But if he has pledged or transferred shares to an institution like Sberbank Capital, he may be left with an operative stake in Rusal of about 28%. Supposing that the state banks have agreed to pay for the Trafigura deal in order to meet Deripaska’s $16 billion demand for Rusal’s 25% stake in Norilsk Nickel, this will enable Rusal to clear its debts to the foreign and domestic banks, and generate a substantial premium to be shared by all those engaged in the transaction sequence. What then happens to Deripaska’s personal pledges may be up to Sberbank and Sberbank Capital to decide. Sberbank agreed to review the questions asked on the Trafigura financing syndicate, and promised a reply by close of business yesterday. This did not materialize.